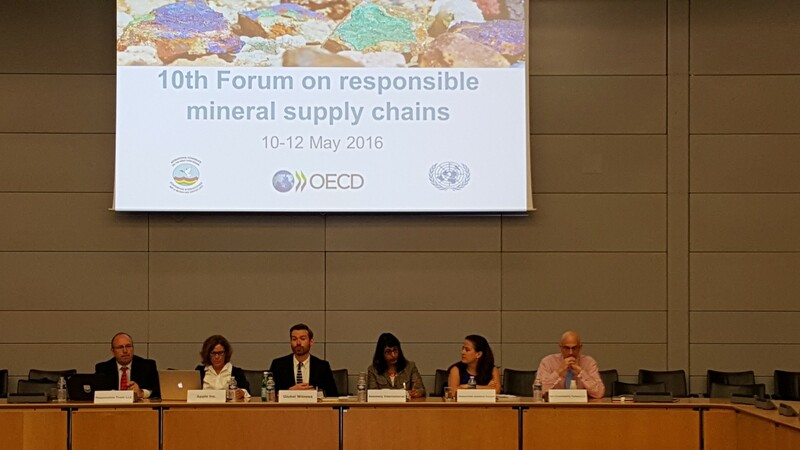 I just returned home from an intense week of meetings in Paris associated with the 10th Forum on Responsible Mineral Supply Chains, co-organized by the ICGLR, OECD, and UN Group of Experts. With over 600 participants registered, this was the biggest ever meeting and significantly larger than the first forum held in December 2009 with about 70 attendees. As I’ve been active in the forum’s activities since attending the first meeting, I reflected on how the engagement and diversity of stakeholders has grown over the years. This has brought new, more global perspectives to the table, and generated a broader discussion on how stakeholders can address the issue of responsible mineral sourcing both individually and collectively. I had the honor of participating on a panel discussing downstream companies’ implementation of supply chain due diligence along with other industry and NGO experts from Apple, Amnesty International, Responsible Jewelry Council and Elm Sustainability. The session was moderated by Dr. Michael Gibb from Global Witness, and highlighted how downstream companies are conforming to the US Securities and Exchange Commission’s Conflict Minerals Rule and the OECD Due Diligence Guidance. Further, the panel examined how companies are embedding risk-based due diligence into their supplier engagements. Need to Reduce Due Diligence Cost– The cost of due diligence is too high. There is a need to reduce the cost without jeopardizing the integrity of the various due diligence systems, both upstream and downstream. Downstream Should Pay Upstream Cost– There was significant pressure from a number of the participating stakeholders that downstream companies should be funding more of the upstream due diligence cost and that the upstream cost is disproportionate to the downstream cost. Companies Cannot Outsource their Responsibility– While companies can and should utilize industry validation schemes and other third party providers to perform due diligence, they cannot outsource their responsibility. Instead, they should ensure that the industry programs they are part of have credibility. The ultimate responsibility for conformance rests on companies. OECD Due Diligence Guidance Applies to All Minerals– The third edition of the OECD Due Diligence Guidance was issued, clarifying that it applies to all minerals including metals, precious and semi-precious stones, oil and gas. The OECD will begin working on a tool to help companies implement Step 1 and Step 2 of the Guidance, and start with providing guidance for certain higher risk minerals, namely, cobalt and precious stones. I expect there will be plenty more discussion around this. Need Metrics to Measure Effectiveness– There was a desire to develop metrics that can be used to evaluate the effectives and impacts of the Guidance in areas like improved livelihood, economic development and security. Work on this issue is still being scoped out by the OECD in collaboration with a small group of stakeholders. Global Participation -There was more global participation than ever. While there continued to be good representation from the ICGLR member countries, North America and the EU, this year’s forum also had good representation from Latin America, China and other Asian countries. Broader Discussion – The discussion in the early years was primarily focused on the African Great Lakes Region and 3TG due diligence development and implementation. The discussions still included 3TG implementation; however, there was an increased focus on child labor, artisanal small-scale mining, other minerals and other geographies. While it was an exhausting week, it was also very productive! There was excellent discussion and a lot of progress was made. Tyler Gillard and the team at the OECD should be commended for their efforts to facilitate and manage the forum as well as the achievements that have been made to date in the area of responsible mineral sourcing. Numerous participants commented on how interesting it was to see such collaboration from the multitude of stakeholders present. I look forward to working with companies and other stakeholders on advancing the issue and to measure the progress at next year’s forum.